A couple of posts ago, I mentioned that I had made some felt balls by wet felting them in the washing machine. 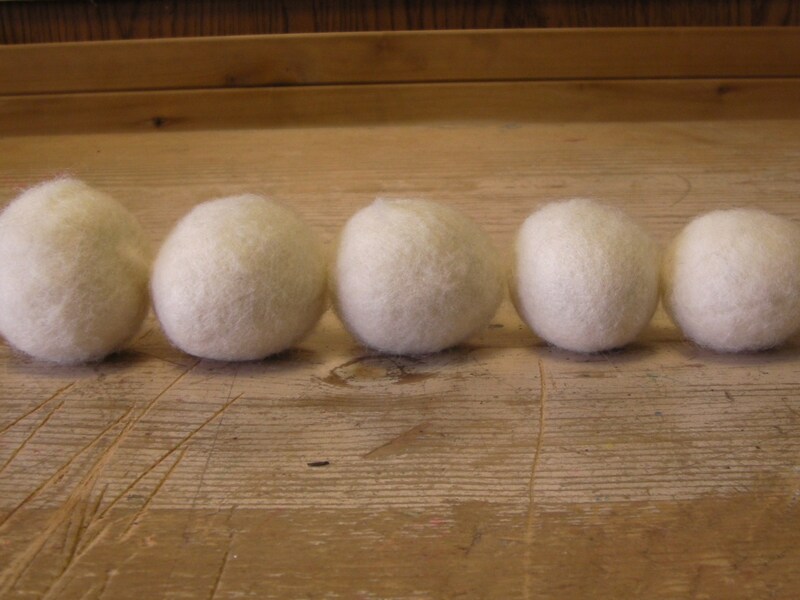 While researching for that project, I came across something called wool dryer balls. I was so intrigued that I decided to do a little experiment. First, I would like to tell the reported benefits of wool dryer balls. The idea is that you throw a few felted balls into your dryer when drying a load of laundry. The touted benefits are up to 40% shorter drying time(saving you money on that energy bill), and less wrinkles. This is supposed to be a green, ecofriendly way of replacing dryer sheets and fabric softeners, because it is reusable and natural. You can even drop a bit of smelly essential oils onto the wool balls if you want your clothes to come out smelling fantastic. I was so totally drawn in by the listed benefits that I decided to do a science experiment. It reminded me of my school days; coming up with variables and constants. I decided to try it out with cloth diapers. 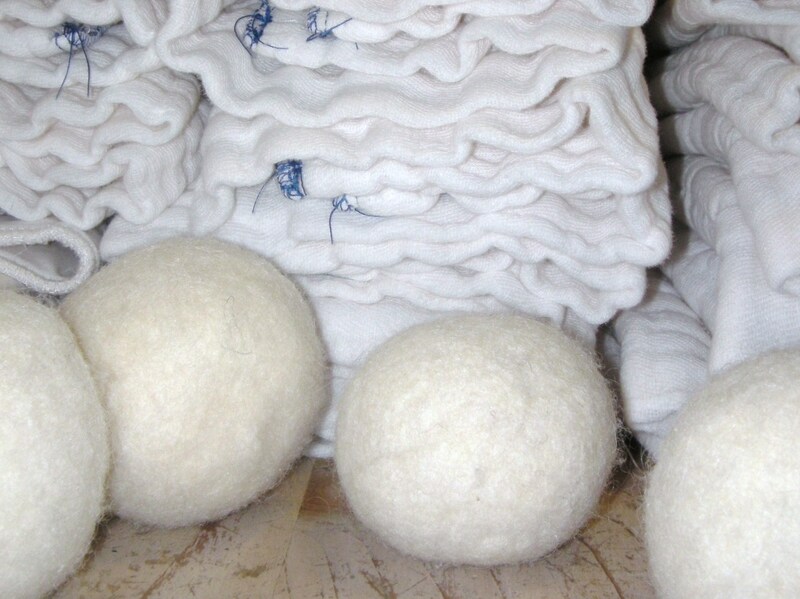 Wool balls are safe to use with cloth diapers, while dryer sheets and fabric softeners mess with their absorbency. Also, my diapers take forever to dry. So the set up was 15 cloth diapers a load; that was the constant. The variable was the felt balls. The first load without the balls took 100 minutes. Now you can see why I chose diapers to test this with. My dryer only goes up to 80 minutes and then I have to reset it. The idea of saving money by less drying time was so tempting. Now on to the second load, 15 diapers and 4 felted balls. I was excited and checking every 20 minutes or so, “Are they ready now?”, “now?”. The second load was finally dry! But, alas, it took 100 minutes. It was a failure. I was so disappointed, I truly wanted it to work. The idea is sound. The wool balls absorb some water from the wet clothes and agitate them so more hot air circulates through them. I had heard tennis balls and simply a dry towel have similar effects. Are all of these suggestions wives’ tales or am I doing it wrong? The tests are not over yet, a hundred wives can’t be wrong! I will try again with more balls and perhaps something besides diapers. They are a beast to dry to begin with.